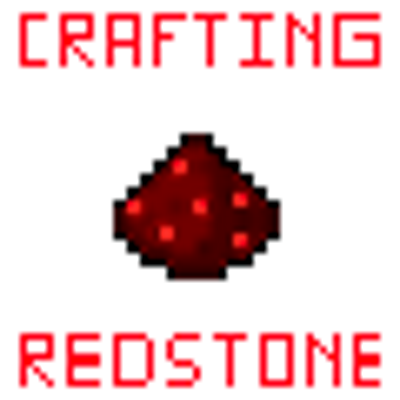 Crafting Redstone is a mod that adds in a few items that make you able to craft Redstone. The mod is still very much a work in progress. If you have any ideas for me. Please don't hesitate to tell me as I am open to any ideas you may have. if you do have ideas for this mod please make sure to message me. I will try my best to respond to all of the messages. I got the idea to make this mod after the many years I have played MC and having to deal with all the mining for Redstone if you are like the same then this mod is for you. CR V1.4 is being made. Support has dropped for 1.11.X and I will now solely focus on 1.12.X and up. This project isn't dead and 1.4 will be a big update. As a little spoiler the red dye will no longer be the way to make redstone, it will now be a custom thing called Energized Crystals which seemed more fitting. You may use this in a modpack but if you can please message me first. what's the powder you surround in red dye? That is dust. It comes from breaking a dust block that generates randomly in your world. When I release 1.4 dust will be gone and replaced with something else called Energized crystals. How do you craft Redstone? Edit: Type it into the description of this mod. Ok I will type it into the desc. Thanks for the heads up on the crafting. Edit: Pictures were added explaining how to craft the items.